Divorce is never easy on anybody. It doesn't matter if you were the one who initiated the proceedings or walked out on the relationship, it is still painful, and you will grieve over the loss. You will lose not only your spouse and coupled marital status, but most likely you'll experience a loss of sleep, a loss of appetite, possibly any sense of wonderment or contentment with your life will also vanish while you struggle with material losses, either financial or personal or both. While it might not be an ideal time to buy a home, you still need a place to live and, if you're used to living in a home you own, you may want to buy another home right away. Buying a home when getting divorced is possible, but you might need the cooperation of your spouse in order to do it. The reason? Title companies in community property states will require your spouse to sign and notarize a type of quitclaim deed, disavowing/transferring any acquired interest in your home. 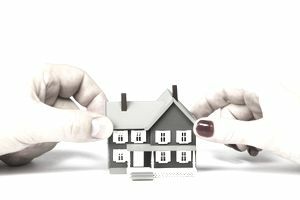 Even non-community property state laws might consider the purchase of a new home while in the middle of a divorce a marital asset. If your spouse is angry with you or non-communicative, obtaining a quitclaim deed or an interspousal transfer deed might be difficult if not downright impossible. You might be tempted to buy the home in somebody else's name, a family member or friend, but if you use joint assets to conceal a purchase, it could come back to bite you later. The bottom line is if your spouse refuses to cooperate, you might not be able to buy a home until your divorce is final. In California, there is a legal procedure called bifurcation, which restores your status to that of a single person while the other aspects of the divorce are still being hammered out, subject to a minimum time of separation. The time requirement is 6 months between the time your spouse was served with divorce papers and now. If you are in the early stages of a California divorce, bifurcation does not seem to be a viable option. Some states will require that a divorcing party obtains court approval in order to buy a home while in the middle of a divorce. This occurs more often when "marital assets," i.e. generally money or equity accumulated during the term of the marriage, are used to buy a home. Ask your lawyer if you need court approval to buy a home while divorcing. Don't just run out and pay cash for the home, hoping nobody will notice. Somebody will find out. You don't want to make false statements on court documents. The first problem might be affordability. If you were a two-income family, dropping to a single-wage earner might reduce your purchasing power for a home. Newly single women are often affected more severely by this than men because women still, in this day and age, do not earn an income on par with men. This means not only may a woman need to cut her lifestyle in half but maybe even more so to account for her substantial financial drop from a two-income family to less than that of a single man. The second issue could be qualifying for a loan, getting past underwriting, due to increased expenses such as alimony or child support payments. If your back-end debt ratios are too high, you might get rejected. The underwriter may want to see evidence that your debt load will not change after the divorce. If you are still sorting out the details and negotiating, this could cause loan rejection. There are lots of things to buy after buying a home, and after you emerge from divorce, you could be left with less than half of your home's furnishings. Generally, joint credit card accounts are closed. You could find yourself using empty cardboard boxes as tables and ordering Chinese take-out because you don't have a microwave and maybe cooking was never your strong suit. You might also find yourself wondering if you should take on a roommate to cut expenses, which could be a helpful solution. But at least you have the opportunity for a fresh start in your very own new home.